Why I Picked This Book: The astrology aspects interested me and I love this author's books under the name Connie Archer. My Impression: I must say this is the first book I've read about an astrologer. I'm familiar with horoscopes but never gave much thought to all the retrogrades and what have you. I found it interesting that while Julia is an astrologer she's very clear about how different that is from psychics or mediums and all the other things that get kind of lumped together. Julia herself is an interesting character. She's intelligent and a bit damaged without being angsty about it. She takes her job seriously and I liked that she was professional in how she dealt with her clients. It always drives me a little crazy when the main character in a cozy mystery has a job but never actually seems to do it. With Julia not only do we see her doing her job but we see how the protests from the followers of Reverend Roy impacts her professionally and personally. I also enjoyed seeing members of the occult community coming together. I was a little annoyed with Julia's reluctance to report certain events to the police. As the story progressed it became clear why she didn't trust them but it did bother me that she refused to make a police report and then would immediately encourage a colleague to call the police so that there would be a pattern of harassment. It didn't make sense. There's also a little more telling than showing which at times kept me from getting fully into the mystery. Since I've read and loved other books from di Marco under the name Connie Archer (A Clue in the Stew is fantastic) I think this is because it is the first book in the series and a lot of setup is required. I really enjoyed the mystery itself. There's a lot going on but di Marco never let the story get confusing or muddled but kept me guessing throughout the book. I was never certain how things were going to unravel until they did. This was a fun read with an entertaining and unique main character. I'm looking forward to seeing what kind of trouble Julia gets into next and how she and her friends get themselves out of it! Would I Read More of this Series/Author? : Absolutely! I'll definitely be picking up the 2nd book in the series and I'm looking forward to catching up on her Soup Lover's series under the name Connie Archer. Would I Recommend this Book? : Definitely! There are a few first book in the series flaws but the mystery and the characters are so much fun! You are soo on a cozy mystery reading binge! I think a lot of first books have a lot set up. I'm glad the mystery kept you guessing. Thanks so much for hosting my stop today, Katherine! Hmm this does sound interesting. The astrology angle is certainly fun and I'm glad this was a good one. I think it would be interesting to see how astrology and mystery mix- that's a good combo! Hi Greg ~ I thought it was a good combination too! I hope you get to enjoy Julia's trials and tribulations very soon! Best of luck, Greg! It sounds so intriguing and I want to read it! Hi Donamae ~ Wishing you lots of luck and thanks for visiting today! My friends and I were into astrology in high school, just a fun thing. This sounds like a nice start to the series. Hi Christy ~ You might enjoy listening in on Julia's sessions with her clients! Best of luck! Reading lots of good reviews, can't wait. Hi Connie! Hi Sally ~ Thanks for visiting today! Really hope you enjoy Julia and her cronies!! Best of luck! I am very interested in the astrology theme. I hope this is the beginning of a lone journey. I had charts done, followed horoscopes, and review Zodiak characteristics. Fascinating! Hi Kathleen ~ You're a woman after Julia's heart, I think you'll enjoy visiting with her and her clients! And she even uses astrology to figure out the murderer! Best of luck! Ohh great review this one really looks and sounds absolutely great and very intriguing. Thank you for your awesome post. Thanks for stopping by today, Katiria ~ best of luck! 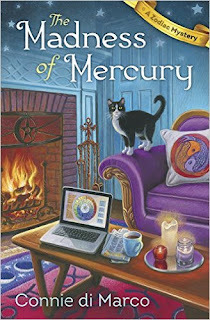 The Madness of Mercury sounds like a great cozy mystery, and I adore the cover art. Hi Jen - didn't the artist do an amazing job? She gave Julia a psychedelic apartment and I love the fireplace too! Best of luck to you! I'm reading this one now for a blog tour. I'm enjoying it. IKnterested me enough, Katherine, to enter the giveaway - something I rarely do. This is one I have been wanting to read. I like the idea of an astrologer as a protagonist. Although I'm not a 100% believer, I do find astrology interesting.